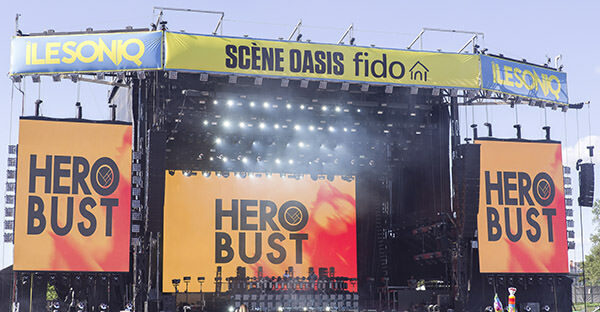 Herobust’s music has heavy and almost violent beats, with hard drops and a powerful bass. This set the tone for the rest of the evening. 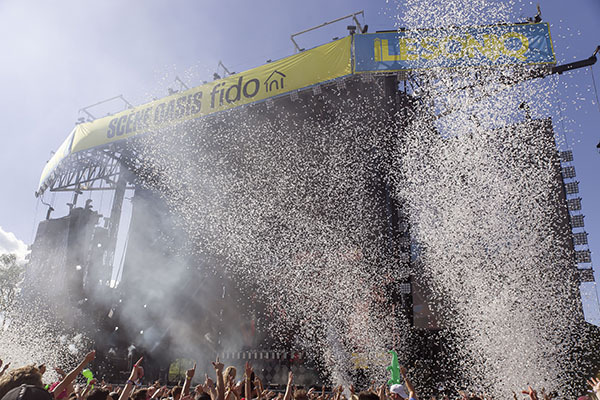 Indeed, the music at ÎleSoniq, as I was soon to find out, is very high-energy and privileges heavy drops. The more sets I heard, the more Skrillex came to mind. After Herobust, I headed to the Neon Stage, which was the smallest stage, with a bouncy floor (which is built on water !) made of firm floating plastic buoys. There I was able to hear Ilan Bluestone’s set. Bluestone is signed under Anjunabeats, and his music was hypnotic and flowing, as opposed to Herobust’s which was way more aggressive to the ear. Finally, I went back to the main stage and saw Kayzo, Diplo and DJ Snake, all back to back. 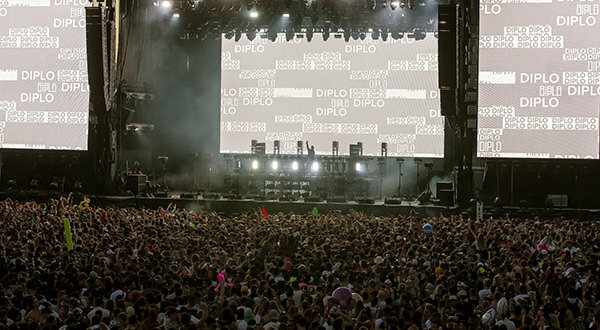 Diplo and DJ Snake are two of the biggest headliners of the festival. Unfortunately, their playlists were so similar you could not have been able to tell the difference in a blind test. There was no personality, nothing like there was at the smaller Neon stage. 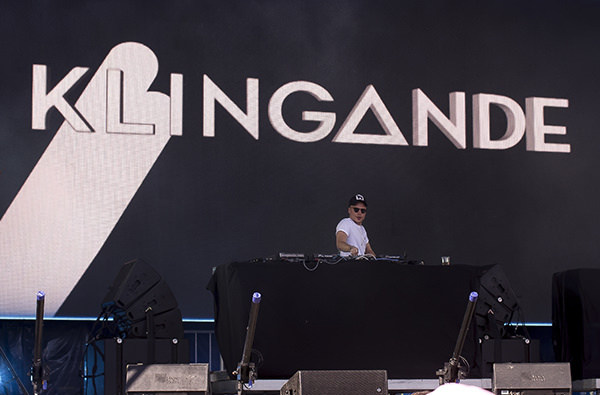 This small stage had smaller artists (like Ivan Bluestone), artists who could take risks because their labels were probably less anxious to make money, they played it less safe and had a smaller audience. Their music was vastly more interesting. Diplo and DJ Snake’s music consisted mostly of barely remixed singles from the past decade, which everyone could easily recognize and jump up and say “I know this one!”. There was little, if any, of their original music, and they actually played several of the exact same songs. This is the damage that commercialization does to music : they could not take any risks because their job was simply to hype up the crowd as much as possible. 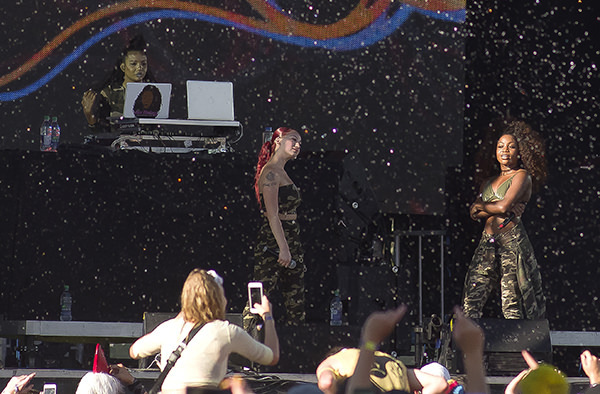 Not discouraged by the bland, one-dimensional sets of DJ Snake and Diplo, I went the next day to see the oh-so-controversial Bhad Babie (yes, she’s the “cash me outside” girl). Bhad Babie had a pretty good stage presence for a 15-year old who got famous for arguing with her mom on TV. Her career is built off of this viral moment. 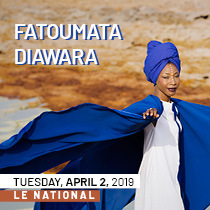 As the songs were unfolding though, she was running out of mojo quickly, and the crowd, half of which was attending the show out of curiosity more than anything, was starting to sense this loss of energy. She freestyled, and while I applaud her for memorizing so many words and having what was starting to sound like flow, I couldn't understand anything she was saying. She walked off and finished her set almost 20 minutes early. A trooper that I am, I decided to wait 35 minutes to see the also controversial Lil Xan. He came out, looking a bit older than he usually does, shirtless, just wearing a strange fanny pack that looked like something a ninja from Naruto would wear. One thing that immediately jumped to attention was the fact that his voice was shot. He had to ask the sound people to put his mic up, because his voice could barely cover his own playback. 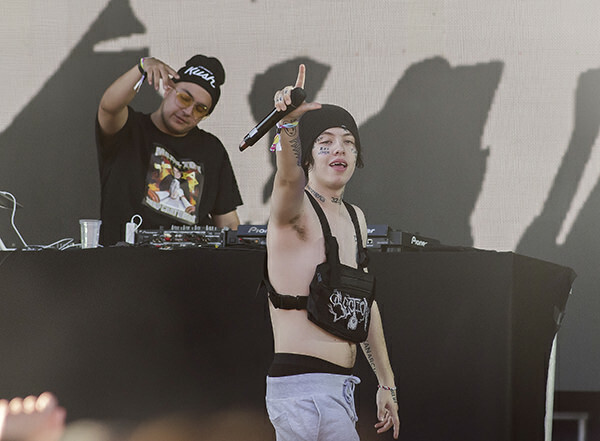 Paying tribute to other recently-deceased rappers, Lil Xan played three songs from XXXtentacion and one song from Lil Peep. When the first notes from XXXtentacion's "Look at me!" sounded, everyone yelled in anticipation of the crazy moshing that would follow. He had better stage presence than Bhad Bhabie, but seemed tired and had trouble making sounds with his voice. The "Xanarchy" hook, which sounded at the beginning and end of each song, was really irritating and seemed like an over exaggerated marking slogan. Lil Xan seemed rushed for time and said "they want me off the stage" toward the end of his set, which he finished with a Lil Peep song. Finally, I attended the Carnage show (which sounded a lot like the DJ Snake/Diplo sets…) and topped it all off with French Montana. French Montana had excellent energy and stage presence, and he interestingly finished his set by playing “Wake me up” in tribute to the recently passed Avicii. So many young deaths and so many tributes, I think, mark the end of an era and the beginning of a new one. Only the future will tell.